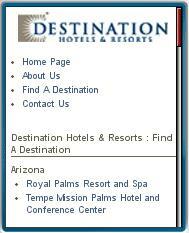 Destination Hotels and Resorts is a 30 property U.S. chain with hotels on the east and west coasts and in Colorado and Hawaii. Their recently launched mobile site is a simple directory of properties with several pages of information, a map and photos for each one. There is no online booking or availability information but direct click to call numbers are provided for each hotel. I can understand not providing online booking given the complexity of handling of mobile credit card transaction processing, but a simple grid showing available dates would do a lot to reduce unnecessary calls and user frustration. I found one pretty big usability flaw with the site. The “Home Page” link on individual hotel pages doesn’t lead to the Destination Hotels Home Page. Instead it only goes back to the first listing page for that hotel, leaving the user stuck there with no easy way to get back to the listing of all hotels. This entry was posted in Site Reviews and tagged mobile site review by Dennis Bournique. Bookmark the permalink.